By the time you read this, Christmas and New Year’s Day will be in the mirror, with all of 2019 ahead. Wow. Could 2019 be even wackier than 2018? Maybe. I’m starting to think so, in fact. The early reaction I gathered to Gov. Andrew Cuomo’s plan to legalize recreational pot use was pretty much universal in saying we ought to go slowly. 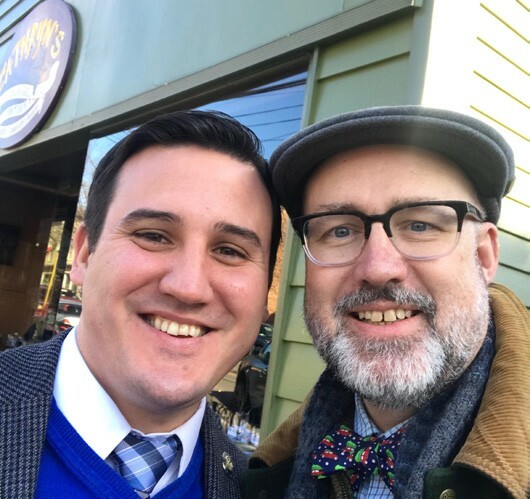 I caught up recently to another of Putnam’s lawmakers, Assemblyman Kevin Byrne, who represents constituents in Putnam Valley, Carmel, Mahopac, Southeast, Patterson, Yorktown and Somers. He’s 34, and moving fast. He actually believes in pushing legislation forward. Considering he’s in the minority party in the Assembly as a Republican, he gets a lot done. When Byrne and I spoke, during lunch at Cathryn’s restaurant in Cold Spring, I’d already covered the pot issue with Assemblywoman Sandy Galef, a Democrat, and County Executive MaryEllen Odell, a Republican. Neither thought we should rush toward legal pot use. Both said we need to know how the impacts play out in states that have already legalized recreational pot (as opposed to marijuana for medicinal use, which is legal in NY already). He’s also against decriminalizing small amounts, believing it is but one step on the way to full legalization. The next step? “I think we could learn more by looking at other states (that have legalized it), and that takes time,” Byrne told me. He also supports the child victims act (to lengthen the statute of limitations for reporting), is against the legislative pay raise, and supports making the property tax cap permanent (it is an imperfect instrument, but I believe that it has, in fact, slowed the growth in public spending, especially school district spending). And while much attention is being given to the MTA and the state of the subway in the city, he called for investment in local roads and infrastructure here, saying that they are our equivalent. He brought the miserable condition of the Taconic State Parkway to the attention of his colleagues, telling them they’ve almost certainly driven over the most unsafe stretches, and they are in Byrne’s district. The lawmakers, he said, agreed the road was in “awful” shape, and were intrigued these miserable sections were in his home district. Important note: Byrne said the Pudding Street interchange work is on schedule for 2019. This is one of the most dangerous intersections on the Taconic. A fix is desperately called for. He is also worried about the state’s debt and backdoor borrowing, particularly through its many authorities (like the MTA, but that’s one small example in the scheme of NYS borrowing). “We’re one of the most indebted states in the nation,” he said. And then, my friends, THEN, I read this fascinating story in the LA Times, written a year into this debacle: One year of legal pot sales and California doesn’t have the bustling industry it expected. (See www.latimes.com/politics/la-pol-ca-marijuanayear-anniversaryreview20181227-story.html). – who knew? And residents think all these pot sales will increase crime. Again, who knew? Here’s a thought, coming from a small business that has to navigate New York state’s Byzantine rules regularly: Do we really, truly, think that NYS is going to be any better on the regulation and taxation front? Really? Did our governor somehow suddenly become a free enterprise, small-biz advocate? Amazon.com, anyone? I’m against legalization, as you now know. But it is possible that even if recreational pot is made legal, NY’s penchant for government and taxes might strangle the industry. I don’t know. Wouldn’t be the worst thing. I wrote a few weeks ago about World War II and how I had listened to In Harm’s Way, The Sinking of the U.S.S. Indianapolis and the Extraordinary Story of Its Survivors. Of 1,195 crewmen, just 317 survived. The column obviously struck readers. A reader in Kent said she had ordered the book for a relative for Christmas, and Anthony Merante of Cold Spring, who has grandchildren in Indianapolis, sent along a couple of photos he’d taken of the memorial, in its namesake town. Incredible sacrifice, and bravery, all those years ago. We are fortunate indeed to be the beneficiaries of that bravery. This issue of the Courier went to press early, due to the New Year’s Day holiday. It should be in your mailboxes on Monday and Wednesday, and at our retail vendors on Monday. We continue to be reachable for news events nearly 24×7 at editor@pcnr.com. Douglas Cunningham is editor and publisher of the Putnam County Courier and the Putnam County News and Recorder in Cold Spring. Reach him at editor@pcnr.com or at 845-265-2468. Letters to the editor are welcome, and should be less than 500 words. Some years ago I read an article on Reefer Madness and what brought it about.The article alleges William Randolph Hearst and his business cronies owned large timber tracts in the Pacific Northwest to cut and use to make newsprint paper for their newspapers.Problem was,America ,including Thomas Jefferson way back when were Hemp farmers and hemp made quality newspaper much cheaper than wood pulp as well as clothing,bags and other items..Hearst went on a campaign to discredit hemp by using it’s cousin marijuana as a drug that causes Reefer Madness as the film “Reefer Madness”portrayed.Congress agreed either from lobbying or just pure ignorance,making it a Schedule 1 drug and making it a law hemp or marijuana CANNOT be legally grown in the USA.Legalizing it for everyday use has another problem now,it’s the cost with production and State and local taxes.Local illegal marijuana producers will undercut the prices licensed stores sell it for to remain in business,forming a Black Market environment.I was visiting in Colorado and that’s what is happening there with legal pot.I grew up in Brewster and if you know anybody who was in High School from the mid 60’s on,they very likely smoked dope and the vast majority of them went on to lead successful,productive lives.Parties at night on Maple Road,with the legal age to drink alcohol at the time being 18,didn’t matter.You could get “stoned” just opening your car door and stepping out into the air,the pot haze was so thick! If you take a stand,either pro or con on pot usage,you really need to try it rather than listening to hyperbole.